Stars: Emily Blunt, Josh Brolin, Benicio del Toro, Victor Garber, Daniel Kaluuya, Jon Bernthal, Jeffrey Donovan, Raoul Trujillo. In Spanish, “sicario” means hitman or assassin. In 2013 Canadian director Dennis Villeneuve gave us the tough and taut claustrophobic thriller Prisoners (starring Hugh Jackman and Jake Gyllenhaal), which made many critics’ lists of the best films of the year. He returns with this powerful, hard hitting and gritty new thriller that takes a look at the US’s war on drugs. It is a war that the US is losing as the powerful and ruthless Mexican cartels hold sway in border towns like Juarez through intimidation, violence and corruption, which is endemic. And they have become even more inventive in smuggling drugs across the border, which leaks like a sieve in some places. FBI agent Kate Macer (played by Emily Blunt) is recruited into a special interagency task force headed by the brash and enigmatic Matt Graver (Josh Brolin), which has been tasked with “stirring the pot” by taking the fight to the cartels themselves. An integral part of this task force is the mysterious and quietly spoken Mexican lawyer Alejandro (played by Benicio del Toro), who seems to have special insight into the operations of the cartels. But he also has a dark past which shapes his actions, and he has his own agenda. Kate’s own FBI partner Reggie (Daniel Kaluuya) is suspicious of the group and its objectives and is largely sidelined by Graver. There is an air of mistrust and suspicion about the mission itself, as Graver also keeps Kate in the dark. The by-the-book Kate finds herself out of her depth in this morally murky world of drugs, violence and corruption. The film has one of the best opening sequences of the year when Kate and a heavily armed FBI team raid a drug house in Arizona to find the walls stuffed with dead bodies. From there Villeneuve slowly builds up the tension and the morally ambiguous atmosphere. He also proves himself a dab hand at action, and there is a superb sequence involving a violent and bloody shootout at a border crossing that is reminiscent of Michael Mann’s Heat. The film is quite critical of the US and its legion of addicts, which has created the demand for drugs, which feeds the greed and corruption of Mexican cartels, and it raises some disturbing questions for which there are no easy answers. In MIFF this year I saw a documentary called CartelLand, which also looked at the war on drugs from two different perspectives. In the first we met a group of self-styled militia who patrolled the extensive border between Arizona and Mexico to stop the influx of illegal immigrants and drugs. But their efforts were often hampered by bureaucracy. The second strand looked at a group of concerned Mexican citizens who were trying to take back control of their town by driving out the cartels by any means necessary. There are a few surface similarities between that documentary and Villeneuve’s fictitious take on the war on drugs. 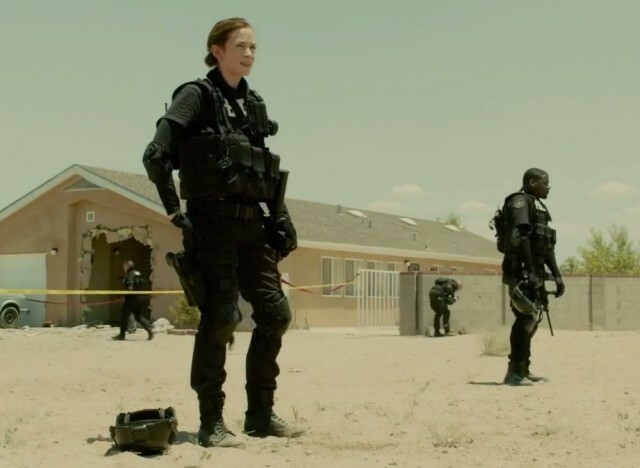 Written by actor turned screenwriter Taylor Sheridan (best known for his role on tv series Sons Of Anarchy), Sicario takes us into the heart of darkness of the war on drugs. Sheridan’s research for the film involved talking to a number of Mexican immigrants who provided insights into the cartels. The film trawls through territory that was also explored in Steven Soderbergh’s Oscar winning Traffic, and it is another addition to that subgenre of tough TexMex dramas featuring films from Robert Rodriguez, the Coen brothers’ No Country For Old Men and Walter Hill’s Extreme Prejudice, etc. The town of Juarez itself is situated just across the border from the US and is separated by a high tech wire fence. But the town itself is painted as a hellhole here. Villenueve captures the oppressive heat, the depressing poverty, the palpable stench of corruption, which he contrasts against shots of the locals trying to go about their daily routine, which is punctuated by the crackle of gunfire and the wailing of sirens. Bodies dangle from freeway overpasses, left as a warning to others. There is also a subplot involving a Mexican cop used to smuggle drugs in his official police car; but rather than deliver some emotional payoff, this character is used to show how even good people can be corrupted by the easy money to be made from the drug trade. Cinematography from Roger Deakins is a major plus, adding to the look and feel of the film. He captures some stark landscapes and there are also some impressive aerial shots that give us a sense of the massive scope of the inhospitable terrain and the unfamiliar setting. Given his body of work, it beggars belief that this guy has yet to win an Oscar. Deakins’ visuals are complemented by a suitably ominous and foreboding music score from Johan Johansson that adds to the tension. Blunt is excellent here. Her Kate is not mean to be a tough and resilient hero in the Ellen Ripley, Clarice Starling or Linda Hamilton mold, but rather an idealistic and dedicated law enforcement officer who is out of her depth in a morally murky and violent world. Kate is shocked by the methods employed to fight this dirty war on drugs and faces an ethical and moral dilemma. Del Toro is also very good as the taciturn but ruthlessly effective and scarily dangerous Alejandro, and he has a strong physical presence which is used well. Brolin brings his typically laconic and droll style and gruff, aggressive nature to his role as Graver, but he also tempers his character with some unexpected touches of bleak humour. A morally ambivalent, brutal, gritty and tough action thriller, Sicario is certainly one of the films of the year, and cements Villeneuve’s growing reputation. It will be interesting to see what Villeneuve does with his next project, which is rumoured to be a sequel to the sci-fi classic Blade Runner.